Sparse attendance marks the “Why Vote? Critical Perspectives on Election 2012” panel hosted by Peace Project. Panelists discussed a range of election-centered issues from immigration to drug regulation. 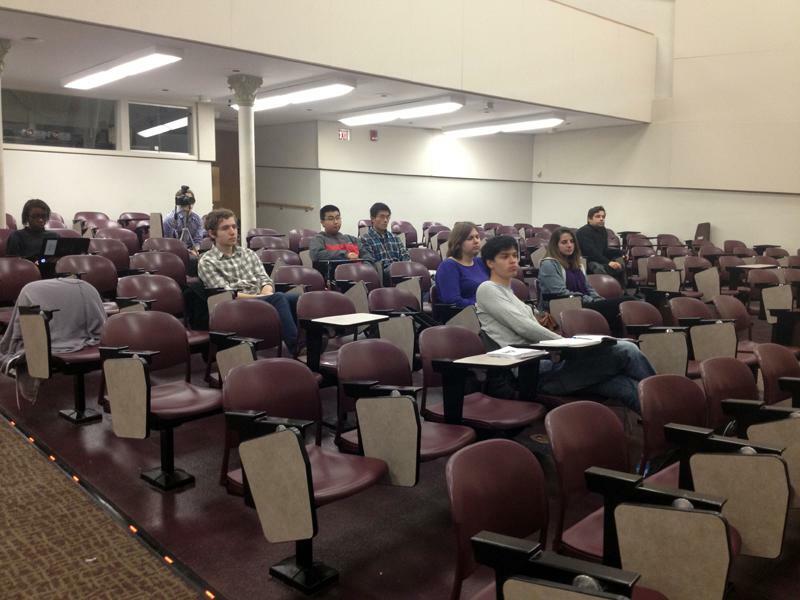 The Peace Project hosted a panel discussion on voting to a nearly empty Fisk 217 on Monday night. The event, titled “Why Vote? Critical Perspectives on Election 2012,” focused on election issues and voter mobilization. Twelve audience members listened to five panelists, each with a specific angle on the election. The panelists ranged from political science Prof. Jacqueline Stevens, who spoke about immigration reform, to Chicago activist Joe Iosbaker. Peace Project president Jack Foster said the low numbers could be attributed to a number of factors, but he said he hoped the small audience took away lessons about grassroots organization nonetheless. Though the group did not have as many attendees as expected, Foster said he wanted the crowd to understand that local politics can have the biggest potential for change. The panelists began the event by speaking for about 10 minutes each. Though they centered on different topics, from marijuana legalization to immigration, their conclusions were similar: Barack Obama is the better choice for president than Mitt Romney. “I would rather have Obama potentially appointing two Supreme Court justices than Romney,” said Matthew June, a panelist and history graduate student. Vince Emanuele, the host of radio show “Veterans Unplugged,” spoke about the need to change American consumption habits in order to begin more intellectual political conversations. “You can’t say to our society, ‘Go watch 42 hours of television and then let’s discuss capitalism,’” Emanuele said. Virginia Alvarez, an audience member and friend of Emanuele, said the panel discussion validated her political leanings. “I hope (the event) ignited a passion for activism that doesn’t fade,” she said.